The Telephone, a Telegraphic Alarm. [p.91] In consequence of the curious and very important experiments on Phonic Signals recorded by Mr. Cresson in the Number for December, 1854, we take from the pages of the London Illustrated News, 1844, the following description of a very neat, compact, and, we do not doubt, efficient instrument for producing sounds, when a steam whistle cannot be used. Editor. 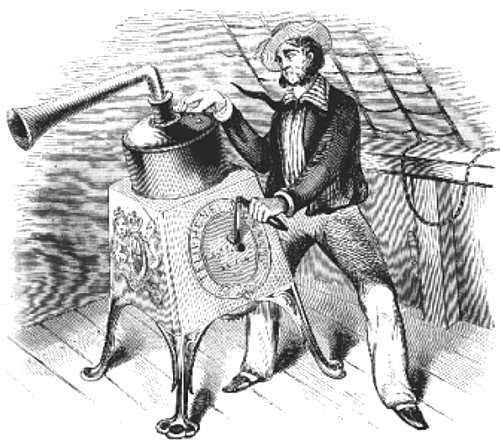 Amongst the many valuable inventions recently laid before the Lords of the Admiralty, that of the “Telephone, or Marine Alarm and Signal Trumpet,” by Captain J. N. Taylor, R.N., is, perhaps, one of the most important; its objects being to convey sound signals to vessels at sea, or in harbor; to transmit orders to and from forts and ships; to prevent collisions at sea, or on railroads; to transmit orders on the field of battle, from position to position, as an auxiliary to the duties of the aide-decamp, or orderly, who frequently rides with important despatches in the face of an enemy in great haste and imminent risk ; to inform engine stations in case of fire ; for alarms in dock-yards, &c.; and as a means of communication between the palaces and halls of the nobility and gentry, &c.
The principle of the Telephone is one of musical accord, composed of four alternate notes, given out separately, played like those of the cornet, and prolonged whilst the finger remains on the note. The instrument is formed of a chamber, into which air is compressed through three or more alternate pumps, which are moved by a corresponding number of cranks, set in motion by a winch ; and of a set of piston keys, with valved apertures, giving free egress to the compressed air, which, in its passage, acts upon a series of metallic springs, and produces the required sounds through four pipes or trumpets. [p.92] The Indicator.—The Indicator, or Signal Tell-Tale, to be placed on the Telephone Drum, to denote the signals made, is composed of 16 holes, in four parallel lines, and numbered at the top 1, 2, 3, 4. The first number made is to be indicated by a peg, placed under the required figure, in the first horizontal column, colored red; the second number in the white; the third in the blue; and the fourth in the yellow line, observing that only one peg is to be placed in the same horizontal row of holes. The Telephone gamut notes are arranged for numbers either by the public or private key. The alternate notes of the gamut C, E, G, C, being denoted by 1, 2, 3, 4. The Telephone Gamut.—The Telephone, No. 1, will convey signals four or five miles; and as a fleet sailing in three columns will not extend over more than three miles, it will be sufficient for the guidance of the whole fleet, in foggy weather, by night or day. For fixed stations, light-vessels, light-houses, preventive ports, &c., it is made the size of a large drum, with trumpet in accordance, and will convey signals in foggy weather six or eight miles; or by unscrewing the trumpet, and applying a parabolic phonic reflector to it, the sound will be conveyed to a much greater distance. Ships or steamers passing each other, by giving the signals for “helm to port,” &c., &c., would prevent those dreadful collisions and loss of life which frequently occur, either from indecision, the thickness of the fog, or other causes. As an alarm-instrument, to be used on light-vessels, light-houses, dangerous headlands, &c., the Telephone is most important, as it will be the means of preventing the great sacrifice of life and property, which so frequently takes place in foggy weather, from the lights being invisible. Vessels would also be directed by it to the pier or harbor, and the height of the tide for entering conveyed to those in the offing. On railroads, too, it is of great importance, as an instant signal for stopping the train, increasing the speed, or of the approach of another engine, may be given from the guard to the engineer. Another advantage of the above instrument is, that it can be employed with a secret key, so that two persons in correspondence will understand the communication, while it remains unintelligible to others. I cannot find the paper referred to in the Journal for 1828. That for 1831 is the volume in which the paper appears. Perhaps some of your American readers will make enquiries about Mr. Stuart’s “telephone” and communicate the result to the Electrical Engineer.—Yours, etc.,R.B P.
* Telephoning at Sea.—The following note is from the obituary of the Daily Chronicle: “Mr. George W. Stuart, inventor of the sea telephone, died of heart disease at New York on December 9th, just after he had secured a promise of capital with a view to pushing his invention.” We are not acquainted with the invention mentioned, nor assured of the possibilities of useful telephone communication between ships, to which it seems to refer. But it is certainly unfortunate that an enthusiastic inventor should die just at the moment when he is within sight of port. If there is anything in Mr. Stuart’s invention, we hope it will not be left to subside without trial.